I greet all of you who are here. Let me say that I've read [the signs; seen below] the kids have written: "peace," "forgiveness," "unity," so many things... "love." 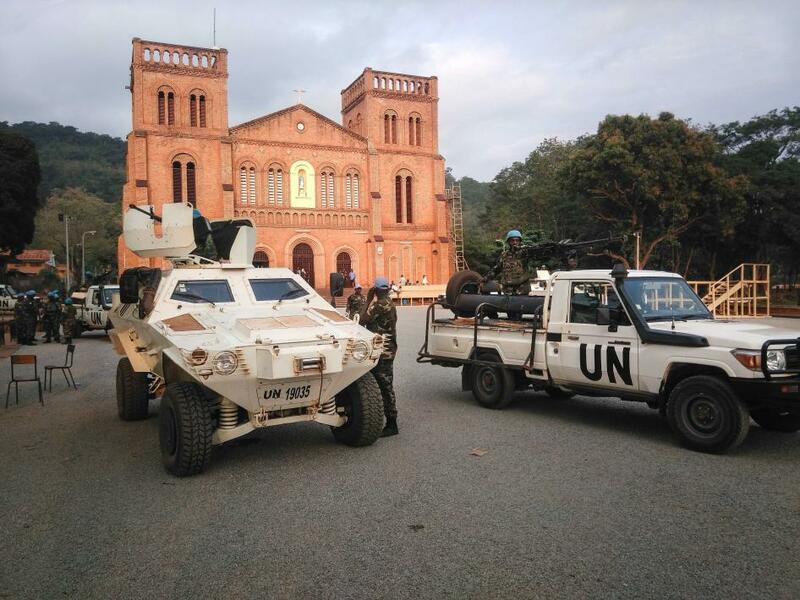 We must work and pray and do everything for peace. But peace without love, without friendship, without tolerance, without forgiveness, isn't possible. Each of us must do something. 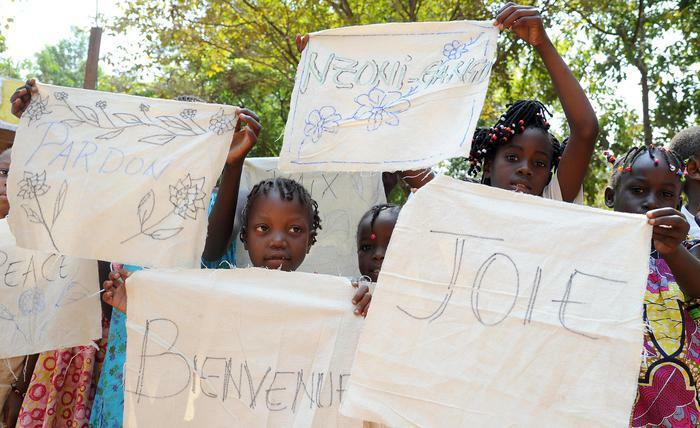 To you and all Central Africans, I wish for peace, a great peace among you. That you might be able to live in peace whatever your background, culture, religion or social situation. But all in peace! Everybody! Because we are all brothers. I would like it if we all could say it together: "We are all brothers." [Crowd repeats.] Again! ["We are all brothers."] And for this, because we're all brothers, we want peace. I'll give you the Lord's blessing too. May the Lord bless you.... And pray for me! Pray for me, got it? Among the signals that a remarkable moment was unfolding: the sight of the editor of the Vatican daily L'Osservatore Romano, Gianmaria Vian – i.e. one of the traveling crew who's seen everything before, and multiple times at that – breaking the entourage's usual reserve to unabashedly snap photos on his iPhone. 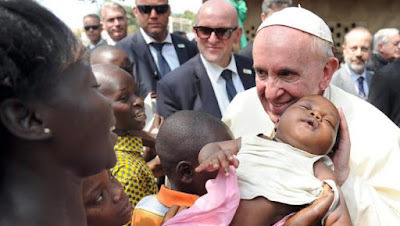 For all its visceral power, Francis' visit to the displaced – representing the million or more forced to flee their homes amid the country's years-long violence spree – was merely the kickoff to this centerpiece day of the Pope's weeklong, three-nation African trek, the journey's symbolic high-point to come at a 5pm local (11am ET) Mass tonight in the CAR capital Bangui as the pontiff opens the Holy Door of the city's Notre Dame Cathedral (above), launching the Extraordinary Jubilee of Mercy in the church's "peripheries" nine days before he presides over the Holy Year's global inauguration at the Vatican. 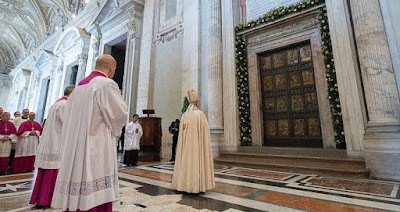 With the local launches of the Holy Year slated to take place on 13 December, Francis will open the Holy Door on that Sunday in Rome's cathedral, St John Lateran, followed by St Mary Major in an evening Mass on the New Year's Day feast of the Mother of God. Back to Bangui, to further emphasize the core of the Holy Year observance, following the Mass Papa Bergoglio will hear an undisclosed number of Confessions from young people as part of a prayer service outside the African cathedral. While Francis' celebration of the sacrament he cites with the greatest frequency – and, indeed, urgency – is a standard part of his visits to Roman parishes, he's only taken up in the confessional once before while on an overseas trip: during the 2013 World Youth Day in Rio, keeping the practice for the mega-event begun by his predecessor. Underscoring the significance of all this, it's hard to recall the last time a Pope's been on the road for the beginning of Advent and its beginning of the liturgical year. Then again, with what's likely to be the most ambitious initiative of his entire papacy just days away from its start, the "new year" opening today is just the prelude.